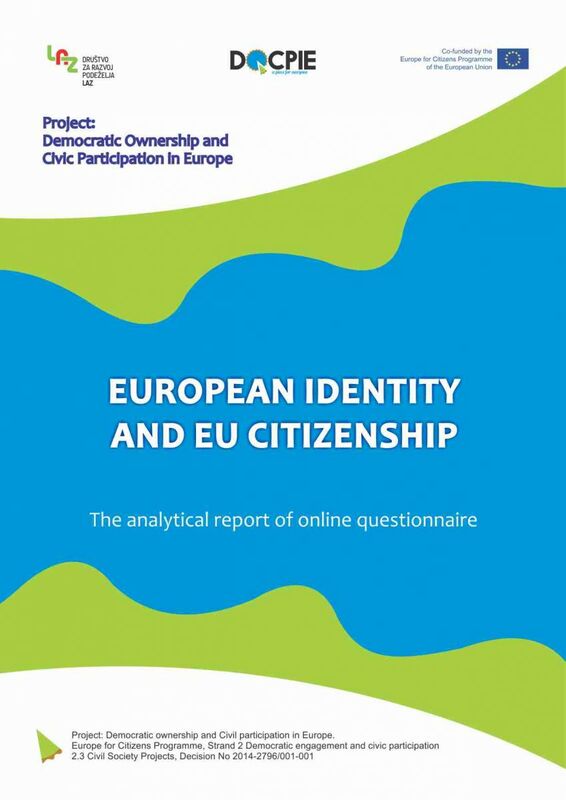 The survey aimed to define the level of awareness on European identity and understanding of the EU citizenship rights. The focus was on specifying reasons for participating and not participating in the European elections, European Citizens Initiative, Citizens' Dialogues, as well using other means to influence political decision-making in the EU. Finally, the survey tried to identify actions, topics and conditions that would strengthen the sense of European identity and to encourage people to be more active citizens of the European Union. During the project, questionnaire has fulfilled 977 citizens and non-citizens of the European Union. Thank you all for completing an online questionnaire. 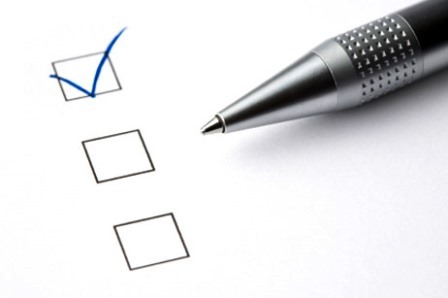 Questionnaire was developed by Lead Partner in order to gather the opinion of the citizens in each partners' country, on topics such as EU identity, participation to elections and EU citizenship. The survey was drafted in first two months of the project, while all partners had the opportunity to review and amend it in order to develop a final version. At partner meeting in Dresden, we thoroughly reviewed the content of the survey and discussed about specific issues in the survey. Familiarization with the all kind of possibilities of public participation through questioner was a great opportunity for the partners to learn about European dialogue and European citizens' initiative etc. The questionnaire was made in English and then each partner translates it in to the national languages in order to facilitate citizen access. It was distributed through online survey tools (1ka.si) to the project target groups. Opinions and suggestions collected from survey participants will greatly help non-governmental organizations and local municipalities within the project DOCPIE. In relation to the latter are formulated as recommendations for the European Parliament and the European Commission. READ the greek survey analysis and policy recommendations for Greece, that was prepared by the municipality of Serres. •	Most of the respondents have a feeling that they are Europeans. Membership of the country in European Union contributes to the sense of European identity among respondents. •	Civil Rights of the European Union which contribute most to a sense of European identity, among respondents were (1) the right to move and reside freely in the EU and non-discrimination on grounds of nationality; (2) the right to study, volunteering and internships in other EU Member States; (3) cross-border consumer rights (eg. Online shopping, rights in international rail or air transport, cheaper calls in mobile networks) and (4) the right to seek healthcare in another EU Member State. •	Actions taken by the European Union, which would most strengthen the feeling of European identity of the respondents are (1) the European agency for addressing cross-border natural disasters; (2) more political rights (direct election of the President of the EU, the introduction of European referendums on important matters in the EU); (3) smaller and more cost-effective administration within the EU institutions; (4) education on European citizenship for children in primary schools; (5) greater political and diplomatic influence of EU in the world; (6) The introduction of the European Week of European culture and (7) participation in discussions on the future of the European Union at local / national level. •	Most of the respondents are interested in politics at EU level. •	Respondents from non EU member countries are on average more likely to attend the elections to the European Parliament as the respondents from the Member States of the European Union. •	The most common reasons why the respondents participated in the last European elections are (1) participation in the elections is a civic / moral duty; (2) representative democracy at EU level is important and (3) a direct impact on decision-making in the European Union. •	The most common reasons why respondents did not participate in the last European elections are as follows: (1) inadequate information / lack of knowledge regarding the work of European Parliament; (2) distrusting the political parties and their programs; (3) disregard/ No effect of emitted voice and (4) lack of time / absence from home. •	The majority of respondents did not sign yet the European Citizens' Initiative. •	The most common reasons why the respondents have not signed the citizens' initiative are (1) lack of knowledge on European citizens' initiative, (2) inadequate information on campaigns / Opportunities of submitting the signatures of support, and (3) the European Citizens' Initiative did not address the problems that affect the respondents. •	The majority of respondents did not participate yet in the discussions on the future of Europe (Dialogues with the citizens). •	The main reasons why the respondents did not participate in the discussions on the future of Europe are (1) lack of knowledge / lack of information on the debates on the future of Europe (2) discussions are not organized in their hometown, (3) lack of time / absence from home and (4) general non-participation in public debates. •	The measures that would according to most respondents encourage active participation in the democratic life of the European Union are(1) more accountable, cheaper and more transparent functioning of the EU institutions; (2) better quality media coverage of EU topics ( more information on the views and opinions of the citizens); (3) strengthening the skills of active European citizenship through primary and secondary school education; (4) transparent and verifiable selection of political and public office representatives in the European institutions, and (5) increased cooperation between European Parliament Information Office and the Representation of the European Commission with the citizens at the local level. To change the way of informing citizens of the European Union on the possibilities of democratic participation at EU level so that a greater attention would be given to local issues that are important for the citizens and not only provide the information on the tools / mechanisms of cooperation. To promote the best practices and examples of democratic participation, which derived from the proposals submitted by citizens at the local level, and the reactions of decision-makers at European Union level and how they resulted in concrete improvements of the legislation, effective problem solving and better quality of life. To educate the citizens of the European Union on the political dimension of citizenship in relation to economic, social and cultural dimensions of citizenship with an emphasis on the local level. To simplify the mechanisms of participatory democracy at EU level (ECI, dialogues with the citizens), in order that the citizens can participate in them from their local / domestic environment. To enable the development of European political parties based on the principle of representative democracy that will support the transfer of local and regional development challenges at European level. To build trust in the European Union through more accountable, transparent and cost-effective functioning of the institutions that will meet the expectations of citizens. To encourage the quality of mass media reporting about the European Union contents, that will include the opinions, views and suggestions of the citizens at local level. To support the work of NGOs in the local environment which seek to strengthen democratic participation of citizens at European level. To encourage the formation of local environments and communities which strive for active European citizenship in cooperation with the European Parliament information offices and offices of the European Commission in the Member States.